Alongside Halo, the Gears of War series has been a major selling point for Xbox fans since the original launched early in the life of the Xbox 360. Gears became a benchmark for dark, gritty visuals, and realistic (albeit excessively gory) violence in console gaming. Epic Games’ graphics technology showed the true potential of 720p resolution and stunned gamers of the time. The third-person camera mixed with an innovative, dynamic cover system made Gears of War a refreshingly new tactical-action game. The Lancer assault rifle (with its chainsaw bayonet) quickly became an icon of the game and a fan favourite; rev the Lancer and excitedly saw through any unsuspecting enemies—or friends. 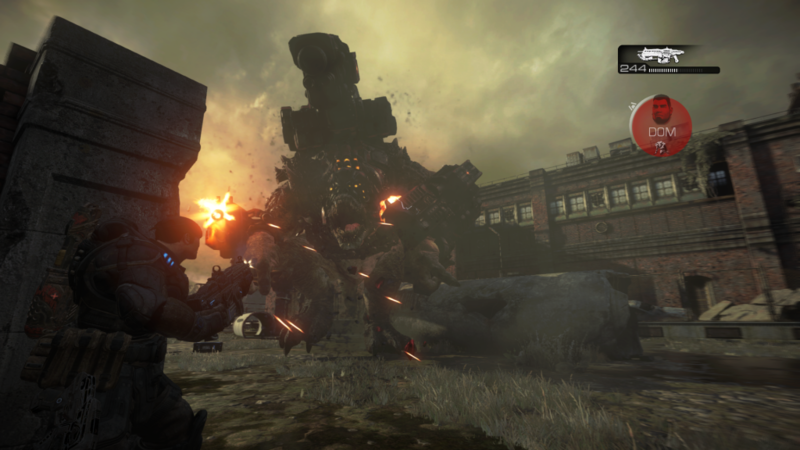 Gears also introduced “active reloading,” a system which showed players that reloading didn’t have to just mean reloading. Proper timing would reward a damage bonus and a faster reload, while poor timing would jam your gun and result in a lengthier reload. Nine years later the original Gears of War is back and revamped as Gears of War: Ultimate Edition. As the latest Microsoft exclusive to be remastered for the new generation (following last year’s Halo: The Master Chief Collection), Ultimate Edition isn’t just improved graphics. Each cut scene has been re-crafted from the ground up to add a new, cinematic experience to the existing campaign, which now extends beyond its original length with additional, previously PC-exclusive levels, including a battle against a Brumak—the largest and most fearsome breed of the game’s subterranean, humanoid antagonists, the Locust. While the pillars of crumbling monasteries, or Colonel Hoffman’s scowling face, may look pleasant in new 1080p resolution, Ultimate Edition’s design decisions are inherently off-putting. The greys and blacks of the original Gears have been replaced with browns and beiges, leaving the once gritty characters cartoonish. The most noticeable difference is in the new dynamic lighting, which adds effects to burning propane tanks and the now-blinding sunlight. The darkness of the original added a macabre horror to Gears; the atmosphere in Ultimate Edition has been brightened—and lightened—significantly. Compared to the momentous technical feats of the original, Ultimate Edition leaves much to be desired from a current generation game. 1080p feels lackluster when running at a lowly 30fps during the campaign, and even the menus sometimes feel sluggish. Gears of War is no longer a game that warrants turning down the lights. On the other hand, Ultimate Edition’s multiplayer is a step in the right direction. Running at a crisp 60fps, it’s most reminiscent in style to Gears of War 3 without the excessive motion blur. The spray of the Gnasher shotgun is as focused as it was in the original game, but Ultimate Edition’s refined cover system (one that has steadily improved with each installment) makes close quarter combat as intense as ever. The variety of public game modes doesn’t offer much diversity, with players limited to two variations of team death match, two variations of king of the hill, and two elimination game modes–including 2v2 “Gnashers Only.” The Assassination and Annex modes are reserved for private matches, while Gears of War 2’s beloved Horde mode is missing entirely. On top, lobby wait times are often painfully long, limiting options even further. Thankfully, split-screen multiplayer is still supported. Staying true to the original Gears naturally meant sacrificing aspects of the succeeding games that were found to be improvements. The curb stomp is once again the sole option for execution finishes, and there is no “meat shielding” to use downed opponents as human shields. Also removed is the “mantle kick” which could be delivered to an opponent’s face when vaulting over cover instead of merely hopping past them. Weapon skins, playable characters from across the entire series, and the ability to highlight an enemy’s position all make returns however. It seems Ultimate Edition developer The Coalition—helmed by Rod Fergusson, formerly of Epic Games—felt adding these features didn’t compromise the integrity of the original Gears of War, and it’s easy to agree. Gears of War: Ultimate Edition is redeemable as a way to play Gears of War multiplayer on your Xbox One. For returning fans, the campaign warrants playing to see the story in a different light and to soak in the nostalgia. For those new to the franchise Ultimate Edition is an excellent introduction to the cover system and unique multiplayer, but with the entire series available on Xbox One via backwards compatibility, I would recommend tracking down copies of the original Gears trilogy to experience the unfiltered campaign. Ultimate Edition pales in comparison to the comprehensive Master Chief Collection, but with a $40 price tag ($50 in Canada) Ultimate Edition should keep your chainsaws revving until the Coalition returns with Gears of War 4 some time next year. Agree, disagree? Let the author know on Twitter @RECCLES66, or share your thoughts on Facebook. This game was reviewed on Xbox One using the editor’s personal copy. Gears of War: Ultimate Edition will also be available on PC in 2016. Reid Eccles is a forest engineer, journalist, aspiring screenwriter, and Creative Writing graduate at Vancouver Island University. He works outdoors to justify binge-watching films and his all-night videogame sessions. His writing has appeared in the Navigator Newspaper and Portal Magazine.